Sonobuoys use a transducer and a radio transmitter to record and transmit underwater sounds. There are three types of sonobuoys: passive, active, and special purpose buoys. Passive sonobuoys use a hydrophone to listen for sound energy from a target. Active sonobuoys use a transducer to send an acoustic signal and then listen for the return echo off an object. Special purpose buoys provide additional information about the environment, such as water temperature or wave height. Aircraft can drop these instruments into the water from altitudes as high as 30,000 feet. Once a sonobuoy reaches the water, it deploys an inflatable surface float with a radio transmitter to communicate with the aircraft and the transducer descends below the sea surface to a selected water depth. 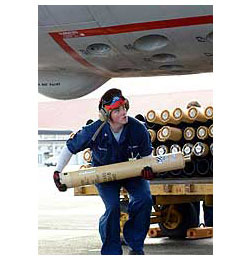 Multiple sonobuoys can be deployed in a pattern to determine the exact location of a target. Sonobuoy deployment procedures after the instrument makes impact with water. Courtesy of Sonobuoy http://sonobuoy.crane.navy.mil. The Directional Frequency Analysis and Recording (DIFAR) sonobuoy is a passive acoustic sonobuoy used by the Navy to detect underwater submarines. DIFAR buoys include one or more vector sensors that give the direction to the source of an acoustic signal. They also typically include non-directional hydrophones. DIFAR sonobuoys detect acoustic energy from 5 to 2,400 Hz and can operate for up to eight hours at depths of up to 305 m (1000 ft). These sonobuoys have also been used for research to track whale populations and monitor underwater volcanic activity. The Directional Command Activated Sonobuoy System (DICASS) sonobuoy is an active acoustic sonobuoy used by the Navy to detect submarines. The “command activated” part of the system allows DICASS buoys to receive radio transmissions instructing the buoy to change depth, activate sonar transmissions, or scuttle itself. Active sonar pulses can be transmitted at four frequencies (6.5 kHz, 7.5 kHz, 8.5 kHz, and 9.5 kHz) and can operate for up to one hour at depths of up to 457 m (1,500 ft). The echo returns of the active sonar signals provide range, bearing, and Doppler information on acoustic contacts. People and Sound: How is sound used to find submarines? People and Sound: How is sound used to study underwater volcanoes? People and Sound: How is sound used to study marine mammal distribution?